When time allows I enjoy getting my weekly fruit and veg from my local market. Thankfully I live a short hop, skip and jump away from a seriously good one in West London, where the stalls are bursting with colourful produce and the stallholders have an infectious energy and enthusiasm for their produce. Bowls of fruit and veg go for £1 and when you buy herbs it’s two large bunches for a £1 – to ask for one just won’t do – so I invariably end up with rather a huge amount of coriander, mint, parsley and dill. Dill, mint and coriander remind me of fond times in Vietnam – the food is so fragrant, largely due to mint and dill being in so many dishes, Cha Ca La Vong being a perfect example – you can see the recipe here. 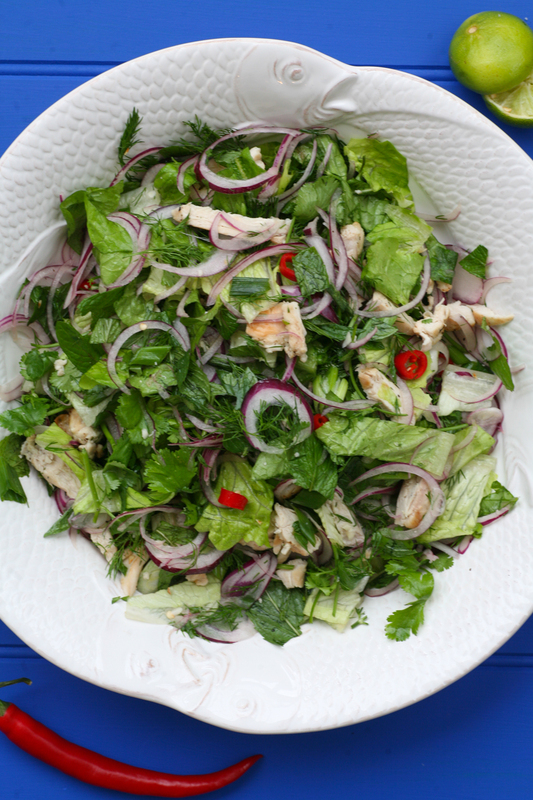 As I ended up with two huge bundles of cos lettuce, I decided to create a Vietnamese inspired chicken salad for our Saturday lunch. Something that could be thrown together quickly and that would appeal to the whole family. It was a success and we polished it all off in one sitting. Since then I have cooked it again (I still have lots of herbs to get through) and photographed it for you so that you too can prepare it at home. 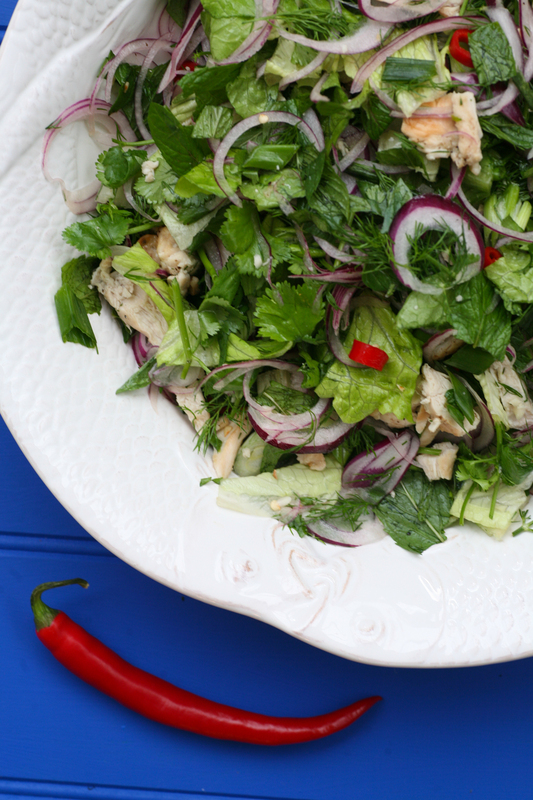 The dressing I use for the salad is the typical Vietnamese dressing of nuoc cham, which adds zing and sweetness, the perfect combo. 1. Cover the chicken breasts in the olive oil and season with a little black pepper. Meanwhile heat a griddle/cast iron pan and when it is hot place the breasts into the pan and bronze on each side for just under 2 minutes a side. Place on a baking tray in a preheated oven 180 degrees for 20 minutes. 2. 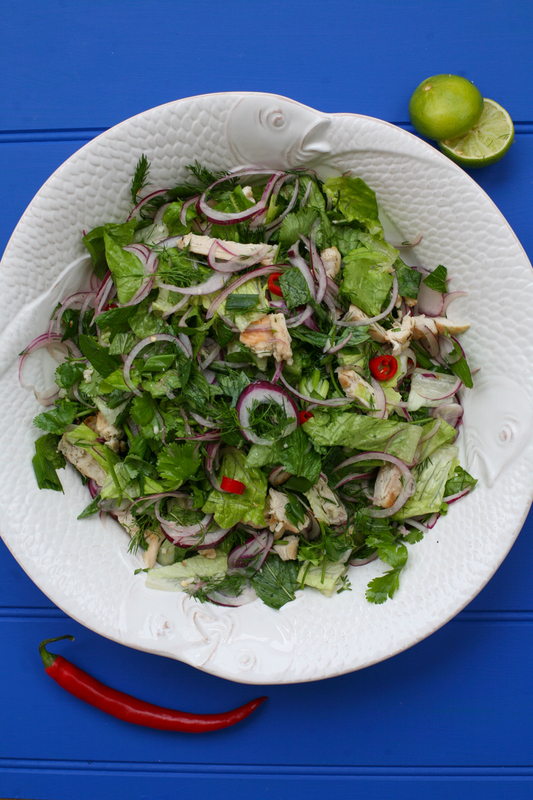 Break off the lettuce leaves and cut into mouth size chunks and place in a large mixing bowl. 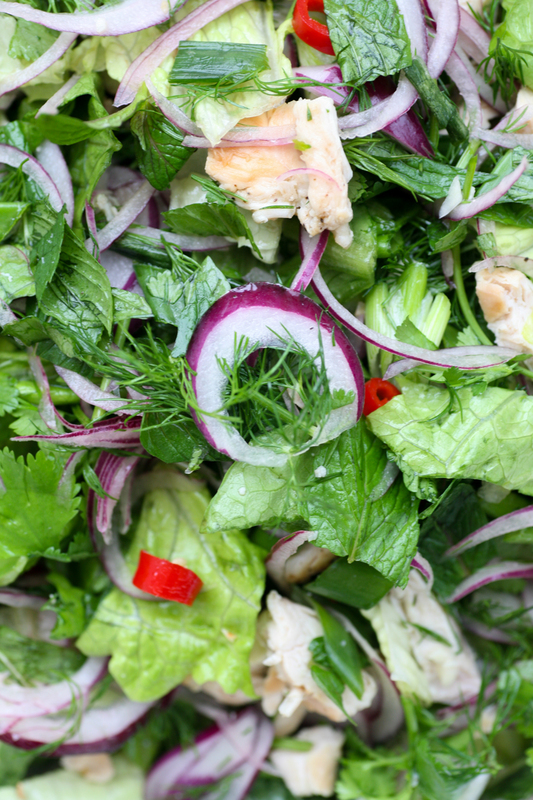 Add the dill, mint and coriander leaves along with the finely sliced red onion, spring onions. If serving to children as well slice the red chilli and place in a separate side dish. Mix together gently using your hands. 3. Prepare the nuoc cham sauce by mixing all the ingredients together. If it needs to be a little sweeter add some more sugar, if you prefer it more sour add more lime. 4. Pour half the dressing over the salad and gently toss. Pour the remaining dressing in a small jug so that you can add more dressing over the individual salad portions as needed. This entry was posted in Sauces and tagged chicken, Coriander, dill, herbs, lunch, mint, parsley, salad, supper, Vietnamese food. Bookmark the permalink. Delicious and mouth watering – we did a bit of rearranging but the salad rocks!